See the cover of my new book, “Paranoia”! Two blog posts in one day: a new record! I have very exciting news to share with you all. My next book, titled Paranoia: More Dark Tales from the Mind of G.R. Wilson will be coming out on October 1st! It’s another Horror anthology, even bigger and better than Right Behind You. Prepare yourself for a second helping of eerie, creepy, and terrifying stories from G.R. Wilson, author of Right Behind You: Tales of the Spooky and Strange! Vengeful undead royalty, with a real bone to pick. A scarecrow who takes his job just a bit too seriously. Crawling and buzzing beasts pulled straight from your nightmares. An eccentric Scottish nobleman, ready for a howling good time. Beasts and spirits of American folklore, fresh for modern readers. Whether you prefer Gothic, modern, Lovecraftian, campfire, or any other category of scary story you can think of, you’ll find plenty to enjoy (and keep you up late!) in Paranoia! The cover was done by the excellent designer, pixelstudio, of Fiverr.com. I wanted to go all-out, and have something vibrant and eye-catching, both for its colors and for its subject matter. I’m extremely pleased with the result! For the title, I messed around with a variation on “Right behind you” (“right in front of you”?) for a long time, and I wanted something quick and simple, but evocative of Horror. I began simply thinking of words, and, “Paranoia” just came to me. The idea of the cover imagery flowed from that title, too. And, with the full title, I wanted to make it clear this was another anthology. Subscribe to my newsletter for previews and stories from the upcoming book! If you’d like an advance copy of Paranoia, in exchange for giving the book an honest review on Amazon once it’s available there, please email me at authorgrwilson@gmail.com. I’m only doing five advance review copies, so be quick! Good morning everyone! I had a great start to the new semester yesterday, and after a little hiatus due to a transition, it’s time for a new blog post! Today I want to give a shout-out to the talented Ms. Alexa Armsden, whose name you may recognize as the cover artist for Right Behind You. I always loved to draw when I was younger, but I didn’t start taking it seriously until I was about eleven. It’s something I really love to do and I love thinking of fun new characters I can create! Usually, I get my inspiration from music, poetry, other things I read, and my general musings on a daily basis. Sometimes they work out, sometimes they don’t. The two pieces I wanted to share on here are perfect examples of my process I suppose. The “Hipster Medusa” character came from a “what if this monster girl really liked coffee” idea, and the “Red Girl” came from a song I was thinking about. They came pretty easily, but sometimes it’s really hard to get going with my art. Lack of ideas is usually my biggest downfall! Other than that, I just really love to draw and I was happy to help Geoff out with the book art. Thanks and best wishes, Alexa! 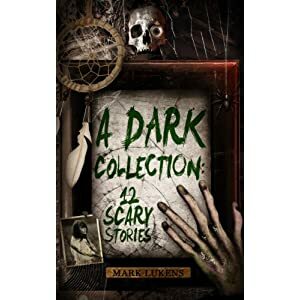 I recently had the pleasure of reading Mark Lukens’ A Dark Collection: 12 Scary Stories. It’s a great little Horror anthology, and when I finished it on the bus this morning I knew I had to give it a good review this afternoon. I came across A Dark Collection while just randomly searching for scary story anthologies on Amazon, (I don’t recall the exact search terms) and buying (for Kindle) one with a good cover and good reviews. For $2.99, I definitely got my money’s worth. Lukens’ collection is composed of 12 stories, one for each month, with a theme (usually loosely) connected to that month. The horrors of each story range from Navajo skinwalkers, to eccentric millionaire manhunters, to psychic cult leaders, to good-old-fashioned zombies (but with a major twist.) Each story is different, and vary considerably in length. They all felt the proper length for their content; the pacing was good. I found myself engaged in each story from start to finish. Lukens’ does a good job of revealing information at a pace that intrigues me without leaving me bored. He has a good minimalist descriptive style; there’s every adjective there needs to be, and not one more. The dialogue and thoughts of characters are for the most part quite natural and contribute to characterization and moving the story along. Lukens’ uses all the senses (where they make sense) in his great descriptions of action, unsettling environments, and disturbing gore. The stories don’t lean on excessive gore to be “scary,” either! I think my three favorite stories were: Crow Manor (January), Squish (March), and Skinwalkers (September). The first because it was intriguing and suspenseful from start to finish, the second because it was a wonderful kind of disturbing, and the third because it was a creepy and unique portrayal of a non-Western monster, and used its period (the Wild West) well. The next time I want a new Horror book, I’ll look to Mark Lukens’ again. I hope he writes another anthology, because this one’s great! If you haven’t already, sign up for my newsletter today and receive more recommendations like these, as well as original stories and news! And email me at authorgrwilson@gmail.com if you have Horror media recommendations you’d like to share with me. This entry was posted in Uncategorized on August 15, 2014 by admin. Good afternoon everybody, G.R. Wilson here! This post goes outside of my usual genre, but I still wanted to share it with you all. While I won’t claim to be an angel, I do of course recognize the importance of careful editing, and, I have edited published work outside of my own. At sixty-two, chairman and CEO and the founder of a successful software firm, Vijay Verma is a handsome, elegant, and physically fit gentleman. Seemingly having no time for poetry or sappy romance, he chose to dedicate his daily life to the perfection of his work, and to the success of his business. But the tragic loss of his beloved wife, Radha, devastated his world to its core. He’s faced a brutal period in his life, as a grieving widower and single father of two children. Will he be able to handle raising the new children that Madhuri desires? How can he justly measure the value of this new lover compared to his old one? Is he even ready to love again? As he looks up at the wondrous stars in the sky, and sips his wine, Vijay does his best to ward off the conflicting thoughts and worries that intrude from a dark corner of his mind. He nearly lost Madhuri recently, to her own ex-lover, and to death. But tonight is Vijay’s night, their night, and he has big plans for this special evening. You can look inside the first couple chapters of Just One More Time here, and read its reviews here. Fawzia Begum enjoys reading and writing about love, technology, travel and music amongst her many interests. She is also a voracious reader of spirituality and personal development. Her literary strength emanates from a rich cultural and political upbringing in her home country. From her early childhood she looked at life through a myriad prism – always questioning and never accepting anything on face value in a culture shroud in dogmas. She carried that strength of conviction and innateness when she moved to the US. Fawzia is an accomplished musician in her own right, mainly playing instruments such as Keyboard and Mandolin. She has published articles in community magazines and newspapers some involved interviewing High-tech entrepreneurs in Silicon Valley, California. She has a B.S. Degree in Geology and a Certification in Technical Writing. Her short novel, ‘Just One More Time’ is her debut into the world of fiction writing. She works as an IT Technical Writer and lives in Orange County, California. I’ve always believed that everyone deserves a second chance in life, especially in love. And that, no one deserves to be alone. I grew up in a culture where second marriage for a widower was not a common place, and still isn’t. Even though rarely a middle-aged man with grown children may remarry, for an Indian widow of any age, it would be unthinkable to get married to another man. Indian films hardly contain stories of unusual love like this story of mine. So I thought I write one and see if I can get someone to be interested. The protagonist, a long-time widower with two children deserved to find love again. He lost his beloved wife but he remained with the living and had every right to enjoy happiness. However, in the process I’ve realized that I’ve created the man of my dreams. Not necessarily someone with grown children, etc., but someone just like this. More I delved deep into the story, I became both characters –the hero and the heroine. Although this can’t be my story, I wish for my younger girlfriends such beautiful love. I really hope that someone in India will convert this to a movie and that it would give hopes to those who have been forced by the society to live without a loving partner. Fawzia has a special offer right now: send her an email fawziab@juno.co, and she can send you one of 5 free copies, so long as you give an honest book review on Amazon! I had a great time editing her book, I wish her continued success in her endeavors, and I encourage those curious to check out Just One More Time. It’s not the kind of book I would’ve picked up on my own, but I ended up enjoying the story and descriptions as I read it. I have big news for you all this Tuesday; subscribe to my newsletter if you’re not already, for all the latest! Trust me, you won’t wanna miss this! Exciting news: my short scary story The Tale of Patchy Jack is featured in Issue 7 of Michael K. Silva’s Horror fiction magazine, The Nightmare Engine, on sale now! The other stories come from Rick Powell, M.R. Stover, and Michael K. Silva himself. Mr. Silva is a talented visual artist and writer: he writes mostly sword-and-spell Fantasy, and he draws lots of great naked devil ladies. Good wholesome stuff! Here’s his website, check out the gallery! You can also connect with The Nightmare Engine on Facebook here. Paranoia: More Dark Tales From the Mind of G.R. Wilson. It’s going to be a bigger and better Horror anthology than Right Behind You; I’ve been working on it all Spring and Summer, and I have a professionally-designed cover on the way! In case you didn’t see it in the newsletter yet, here is a story which will be included in Paranoia. I call it The Full Moon’s Hunt. Sign up for the newsletter today, and get more free stories, recommendations, and special offers! I greatly appreciate Michael K. Silva including me in it. A few days ago, I thanked and recommended the logo-designer Zara Walker, who designed the banner for my site. You can read that post here. Today, I want to talk about another talented individual who’s given me great work. He’s another Fiverr seller, and he goes by the username madscientist. You can check out his amazing art gigs here! You’ll find all of the above horrors, with the exception of Patchy Jack, in my book Right Behind You: Tales of the Spooky and Strange. Anyway, madscientist is friendly and easy to work with, and I think his art speaks for itself! This entry was posted in Uncategorized on August 1, 2014 by admin.